Chicken and waffles can not escape my need to monkey with food. 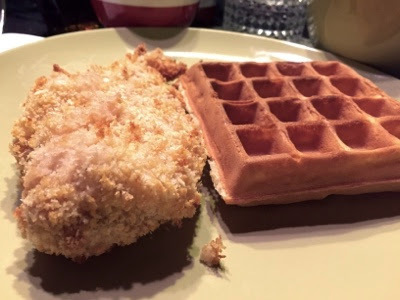 I used rye flour in the waffle mix and chicken coating for increased goodness. Panko. Chicharrones. Egg. Three parts white flour and one part rye. That's oven "fried" chicken and crispy waffles. Where's my chili-infused maple syrup? 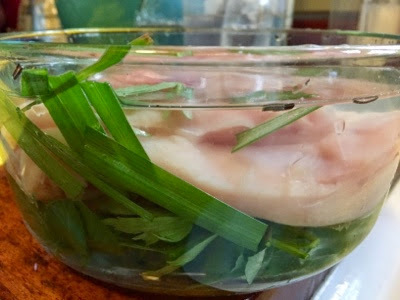 Lemongrass, sacred basil, and rosemary leaves in the brine. Just mash them up and pour the mash into the brine* along with the squeezings of one lime and let it sit in the fridge for a couple of hours. Delicious! The pic, btw, is from my first attempt. My brain was in neutral. Mashing is better. On the mashing subject, last night we had chicken and waffles along with purple mashed potatoes made with St. Andre triple cream brie. Yum. Also, asparagus, but I'll likely do some wilted greens from our garden next time. Here's the allrecipes.com recipe that I worked from for the chicken parts. I scaled it back, of course, and I didn't use as much oil on the pan. I just rubbed rubbed about a teaspoon of sunflower oil on a jellyroll pan. I also used breasts and not thighs. 2. Place flour in a shallow plate or bowl and season with salt and pepper to taste. Put the bread crumbs in another shallow plate or bowl and beat the eggs in another bowl. 3. Dredge the chicken piece by piece in the flour, then the egg, then the bread crumbs, until all pieces are coated. Pour the oil into a 9x13 inch baking dish. Add the chicken to the dish and sprinkle with paprika to taste. 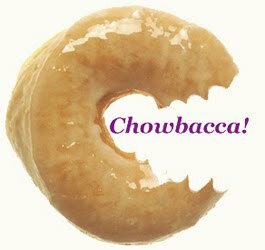 Bake in the preheated oven for 30 minutes, then turn pieces over and bake for another 30 minutes. Remove from oven and drain on paper towels. Enjoy! *I use about two tablespoons per four cups water. Taste yours to see if it's salty enough before you commit the chicken to the brine.